Can Australia prevent the repeat of that scoreline from their previous away series against South Africa? Join The Roar for live scores and coverage of the fifth ODI from 8pm (AEST). The change of venue brought no change of fortune for Australia who were comprehensively beaten by England yet again by six wickets, with more than five overs to spare. England moved to four-nil up in the series, to leave Australia already dreaming of the plane home. 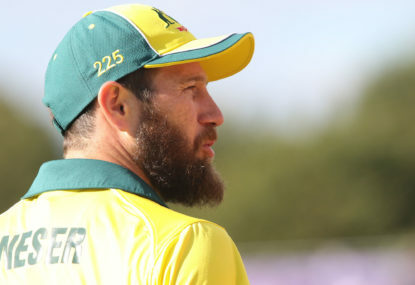 Australia had made three changes to the side that was thrashed at Trent Bridge, with a recall for spinner Nathan Lyon and paceman Michael Neser in place of Glenn Maxwell, D’Arcy Short and Andrew Tye, and a debut for batsman Alex Carey. England also gave an ODI debut to Craig Overton, with Liam Plunkett rested in the encounter. Winning the toss again, Australia this time decided to bat, with Aaron Finch moved back to open with Travis Head, and, this time, they got off to a very good start, as the pair put on 101 for the second wicket, before Head was out to a long hop from Adil Rashid for 63. Shaun Marsh then joined Finch at the crease, and their partnership was worth 123, as the England bowlers were kept at bay for the first time in this series. Finch went on to complete his 11th ODI century and his 5th against England, before he was bowled by Mark Wood for exactly 100, including three sixes. Four balls later the same bowler bowled Marcus Stoinis for just 1. However, Marsh was still going, and, together with Ashton Agar who was promoted up the order, and they took Australia past the 250 mark before Agar was caught behind off Rashid. Marsh and Carey added 39 for the fifth wicket, with Marsh scoring all but five of them, and he brought up his second century of the series before he was caught by Overton off Willey for 101, which included 4 sixes. The visitors then underwent a late collapse, as Willey picked up three more wickets, and eventually closed at 310, with Willey’s four-wicket haul halting their charge at the end. In reply, the England opening pair of Jason Roy picked up where they left off in Nottingham and took the attack to the Australian bowlers from the start. This time it was Roy, with the majority of the strike that led the way, as the bowling went for more than seven an over from the start. Together the pair put on 174 for the first wicket, before Roy, shortly after completing his sixth ODI, was caught at short third man by Marsh off the bowling of Lyon for 101. Shortly afterwards, Bairstow himself fell in strange fashion, mistiming a shot straight into the gloves of Tim Paine behind the stumps off the bowling of Stanlake for 79. But the job was nearly done by then and the win was achieved early, a 4-0 scoreline achieved. Roy was named man of the match. England to make it 5-0 but expect it to be a slightly lower-scoring match than the previous two games. Be sure to join The Roar for live coverage of this 4th ODI at Chester-le-Street from 8pm (AEST) and don’t forget to drop a comment in the section below.